NB. The €100 per person fee quoted secures your place on the weekend and covers the venue, wildlife guiding, field excursions and talks. The special accommodation package at the Celtic Ross Hotel costs an additional €151 pp (€161 for July) and is payable directly to the hotel on departure. 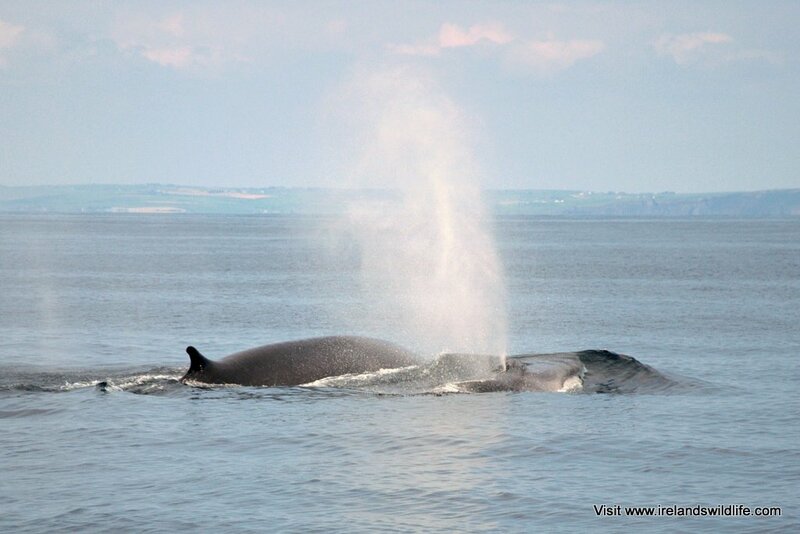 The marine wildlife boat trip with Cork Whale Watch (weather permitting) is available at the discounted rate of €40 pp, payable directly to the operator on the day if the trip proceeds. Based on the stunning West Cork stretch of Ireland’s Wild Atlantic Way, our Discover Wildlife Weekends get you closer to Irish wildlife, both on the weekend itself, and on an ongoing basis by helping hone your wildlife watching skills, so you can see more wildlife wherever you go. What are Discover Wildlife Weekends? Discover Wildlife weekends are all about exploring the wonderful wildlife of the West Cork coast. Our base in the Celtic Ross Hotel in Rosscarbery is about halfway between the Old Head of Kinsale and Mizen Head — with Galley Head, Toe Head and Sheeps Head all within easy reach. These headlands offer some of the best land-based locations in Europe for watching marine wildlife. From any of them you can see large whale species like fin whales, humpbacks and minke whales, several species of dolphins, harbour porpoise, basking sharks, sunfish, seals and of course lots and lots of seabirds. Headlands are also great places to hook up with migrant birds, including the occasional rarity during the spring and autumn migration season. But it’s not all about headlands… West Cork has so much more to offer the wildlife enthusiast… from uplands and native woodland to inland waterways and estuaries to coastal dune systems and rocky shores… there’s a huge diversity of habitat and a wealth of wildlife to explore. Calvin Jones co-founder of Ireland’s Wildlife Tours, and Managing Editor of Ireland’s Wildlife, will be your guide on this weekend. Calvin has been mad about wildlife all his life. He first experienced the wonder of the West Cork coastline in 1993, and moved to the region permanently in 2002. Calvin likes nothing better than sharing his passion for wildlife with others… both on our Discover Wildlife Experiences, and through his wildlife and nature writing. As well as writing for Ireland’s Wildlife Calvin’s work has featured in popular national and international publications like The Irish Independent, The Irish Examiner, BBC Wildlife Magazine, The Countryman and Birdwatching among others, and he is author of The Irish Wildlife Collection book series. When we were putting together Discover Wildlife Weekends we didn’t just take a guess at what you wanted: we asked the Ireland’s Wildlife online community, then crafted a tailored wildlife break around real feedback from wildlife enthusiasts. After each weekend we garner input from participants to help us hone and refine what we offer. We’re confident the result is a memorable wildlife break in a location that’s second to none. What we cover on the weekend will vary depending on the weather, the time of year and the wildlife that’s around at the time. Rest assured that we always aim to spend as much time as possible out watching wildlife. … and who knows what else. This was a very enjoyable weekend and we certainly would attend another one in the future. It was a very nice group of people, and I was glad to see the range in ages participating. It was very helpful to have your scopes available for people to share. What’s included in your Discover Wildlife Weekend? The Celtic Ross Hotel in Rosscarbery — home for the weekend! Discover Wildlife Weekends are residential weekends based at the Celtic Ross Hotel in Rosscarbery, Co. Cork. They run from Friday evening registration through to early Sunday afternoon and include a unique blend of talks and field-based excursions tailored to suit local wildlife activity and the time of year. The fee for the Discover Wildlife Weekend is €100 per person — that includes all talks and land-based field excursions. It does not include your accommodation, food and additional expenses. We’ve negotiated a special 2 night accommodation package with the Celtic Ross Hotel that includes full breakfast both mornings, an evening meal on the Saturday night and a packed lunch for Saturday’s field excursions, all for the great value price of €151 per person (€161 for July)… with NO SINGLE SUPPLEMENT. If the sea conditions are favourable we include a marine wildlife trip with local whale watching specialist Colin Barnes of Cork Whale Watch, aboard the purpose built MV Holly Jo. We’ll look for whales, dolphins, porpoise, seals, seabirds and other marine wildlife off the West Cork coast. A great location, a great hotel, and great wildlife… it all makes for an unbeatable weekend. Book your place now!